Now you can quickly, safely and cost effectively connect or extend your air-cooled TIG torches with a safe, rugged and fully-insulted quick-change power and gas connector for air-cooled TIG torches. 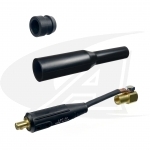 Our new TTC connector kit is designed for dual process TIG/GTAW to Stick/SMAW welding applications, or anywhere that you need to extend a short TIG torch connection. 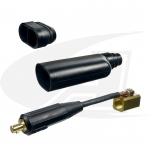 Forget the old and unsafe practice of clamping your Stick electrode stinger to a live and un-insulated brass power cable adapter block. Those connectors belong on your old school welding machines in the shop -- not on the job site. Want to extend your water-cooled TIG torches to reach those tough jobs? 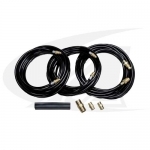 No problem Arc-Zone has put together a complete 25' (7.6m) water-cooled TIG torch extension kit that is quick and easy to install. Next time your dockside and need to access that tuna tower, or railing -- no problem, with our water-cooled TIG extension kits you can take your 25' torch and quickly and simply extend it to 50' (15.2m)! 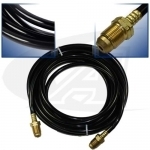 And, if you want an even cleaner setup, Arc-Zone would be happy to build you a custom 50' cable set. . .